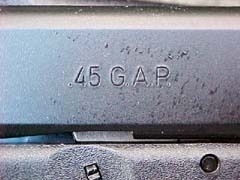 Glock’s New Model 37 .45 G.A.P. Since the introduction of the Glock model 21 chambered for the legendary .45 ACP cartridge, it has been a steady seller, with those who shoot them developing an almost cult-like devotion to the big pistol. 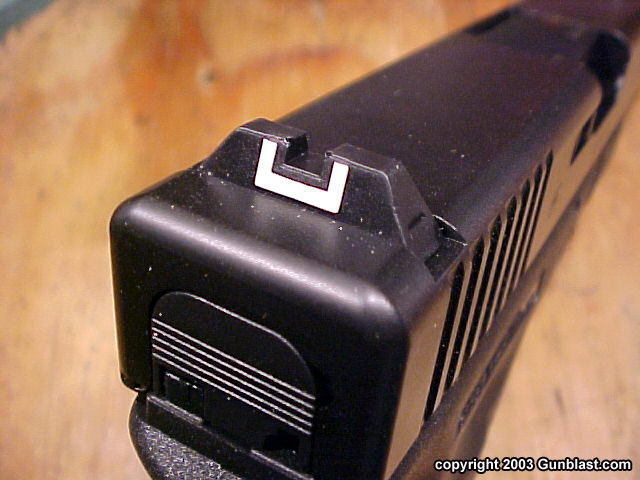 The only complaint that I have ever heard leveled against the model 21 is regarding the size of the pistol’s grip. 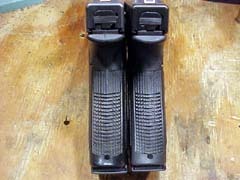 It was designed to hold thirteen of the fat .45 ACP cartridges in a double column magazine, and the grip is necessarily large. This is fine if you have large hands, but is a bit awkward for shooters with small to medium hand sized hands. I wear a size large glove, but find the model 21 grip to be a bit too bulky for my hand. I can shoot it fine, but it just doesn’t have the comfortable feel of the model 17 size grip frame. In an effort to accommodate those who do not possess large mitts, Glock has introduced a .45 that uses a shorter case and still delivers .45 ACP performance. 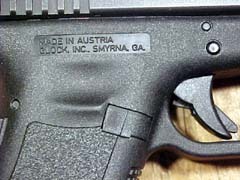 When first introduced at the 2003 SHOT Show, the model 37 had a frame and slide that was very close in size to the medium frame models 17 and 22. The production model 37 received for testing has a frame that is indeed the size of the 17/22, but the slide dimensions are closer to those of the model 21. 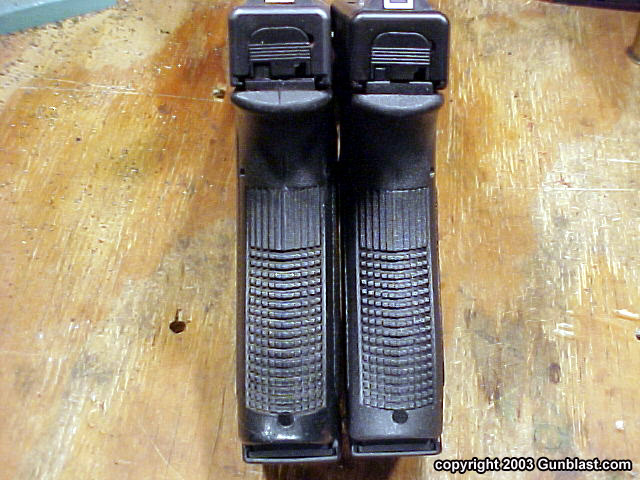 The thickness and height of the slides of the models 21 and 37 are the same, but the model 37 slide is a bit shorter, and is beveled at the front for easier holstering and improved smoothness compared to the model 21. As seen in the chart, the numerical differences are small, but they do make a significant difference in the feel of the weapon. The model 37 grip frame has three finger grooves, and has a small thumb rest on each side. The front of the frame has an accessory rail for attachment of a small flashlight or laser sight, if desired. While the weight of the two pistols is almost the same at roughly twenty-nine ounces, the new model 37 does feel smaller. With the slide dimensions the same, the model 37 fits a model 21 holster quite well. 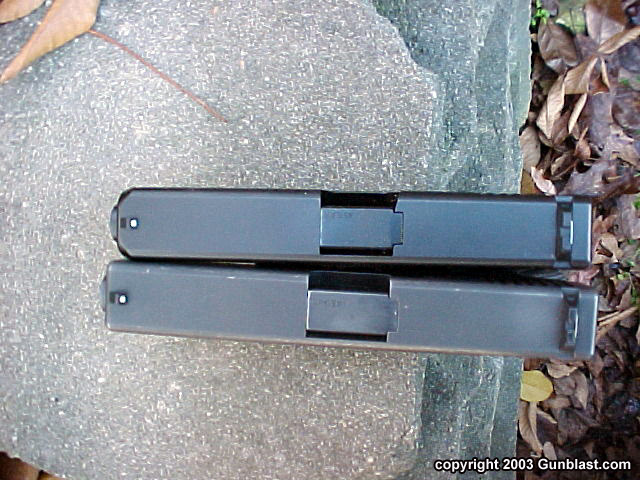 With the smaller grip size, the commercial model 37 magazine holds ten rounds of .45 GAP, with the magazines for law enforcement being of the same ten round capacity. 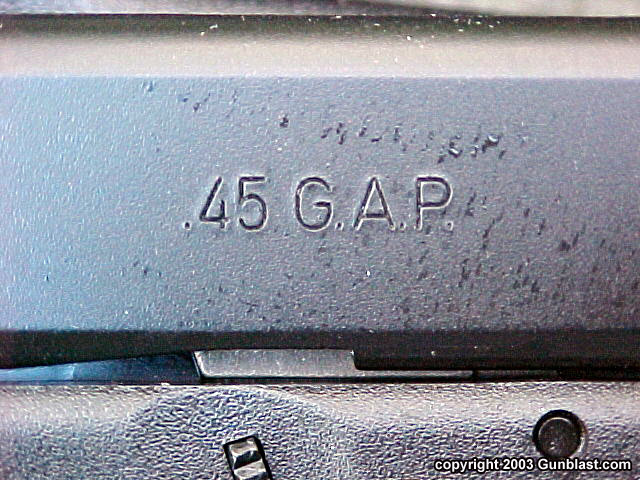 The case length of the .45 GAP is roughly three quarters of an inch. The fired cases measured between .750 and .756 inches. 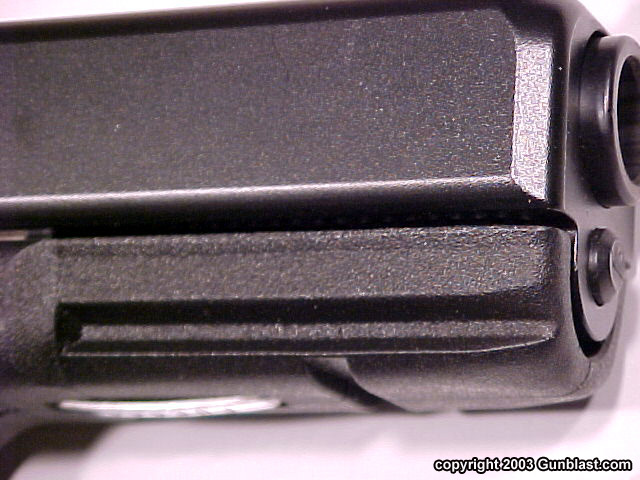 The shorter case allows the grip frame to be smaller and still hold ten rounds. 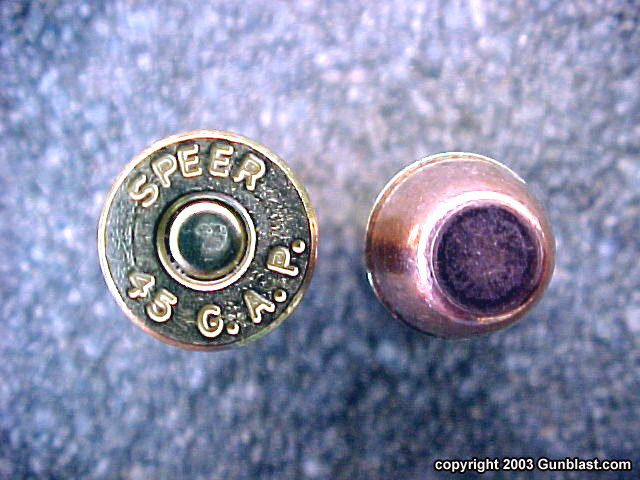 The .45 GAP is loaded to the same velocities as the .45 ACP, with Speer and Winchester offering loaded ammunition at this time. 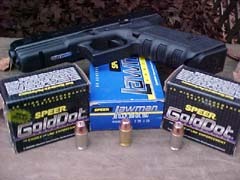 I had available for testing some Speer Lawman 200 grain TMJ flatpoint ammunition, along with some Speer Gold Dot ammo in both 185 and 200 grain hollow point configuration. 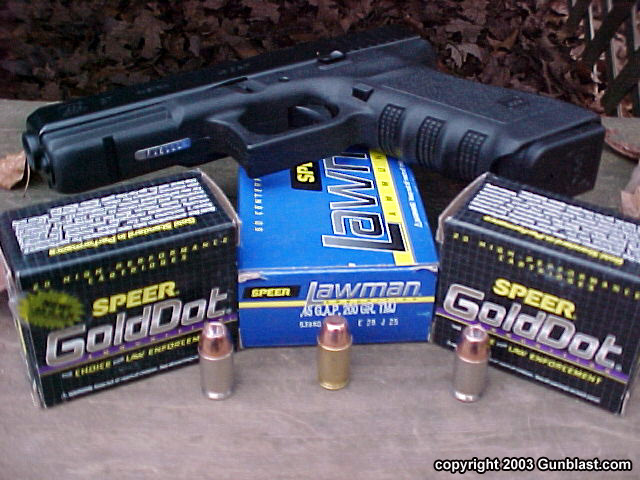 I also loaded a few rounds using my .45 ACP dies, and plan to do a follow-up article on loading for the .45 GAP in the future. I fired the ammunition for velocity and accuracy. The 200 grain TMJ bullet crossed the screens of my PACT chronograph at an average speed of 969.8 feet per second ten feet in front of the muzzle. 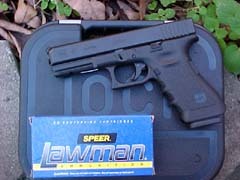 Interestingly, the Speer Lawman .45 GAP ammo functioned perfectly from a model 21, but clocked in a bit slower at 928 feet per second. It is not recommended to fire the GAP in the longer ACP chamber, but I did it just to see if it would work. The Gold Dot 185 and 200 grain ammunition chronographed at 1044 and 1002 feet per second, respectfully. 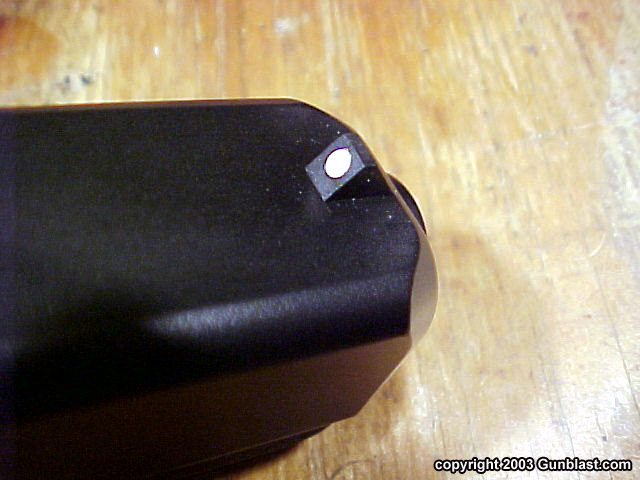 The accuracy of the .45 GAP was very good, with initial testing at fifteen yards producing tight one-hole clusters. 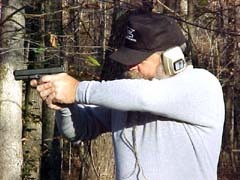 Moving the target out to twenty-five yards opened the groups up to an average of two and one-half inches for five shots. 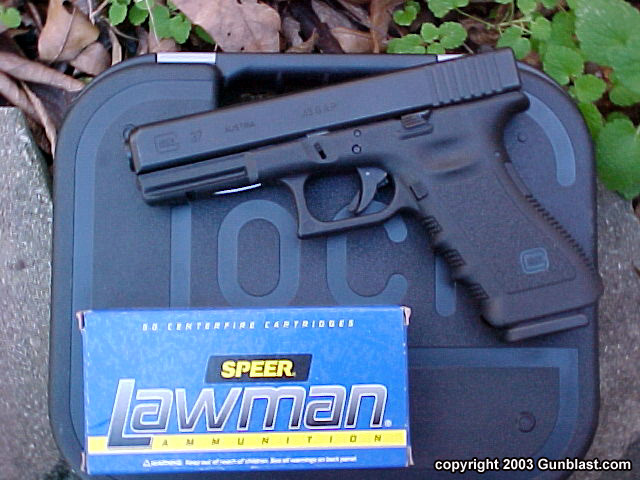 The Lawman ammo shot to point of aim at fifteen yards, and was just an inch high at twenty-five. 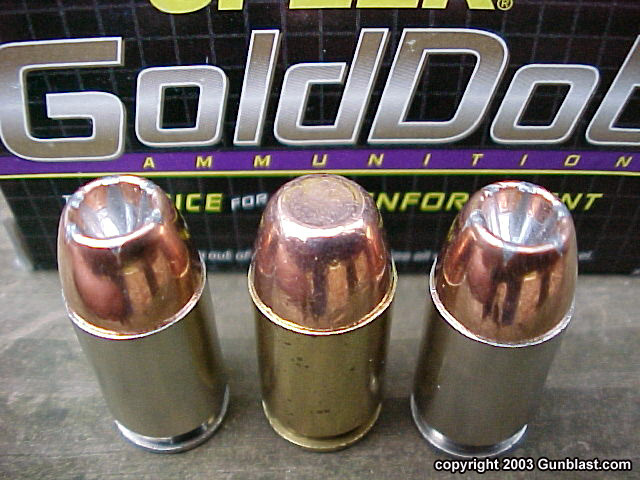 The 200 grain Gold Dot shot to the same point, with the 185 shooting just a bit lower. The model 37 functioned perfectly; feeding, firing, and ejecting every round without a problem. The magazines dropped free with a push of the release button. 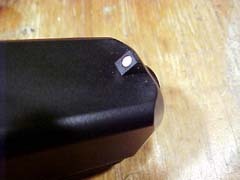 The felt recoil of the 200 grain load was relatively mild, due in large part to the excellent ergonomics of the model 37. The trigger pull measured a smooth six pounds, five ounces. 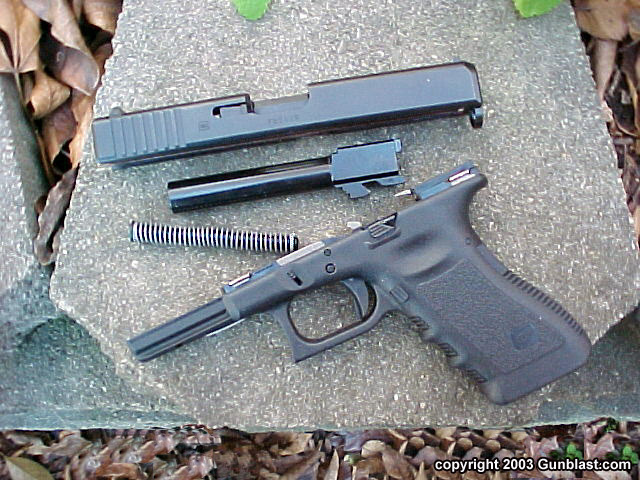 With Glocks, there is usually no middle ground. Some people love them, and others do not (Ed. Note: see Jeff's early article, I Hate Glocks - Boge). The model 37 will most likely be received the same way. 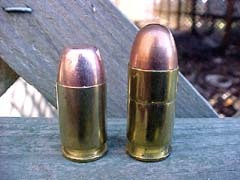 It should be welcomed by law enforcement agencies who desire a big-bore cartridge, but find that the model 21 grip is too large to fit the hands of some officers on their force. 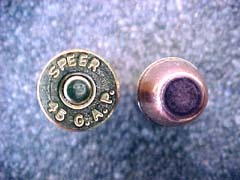 The .45 GAP offers a greater bullet frontal area compared to the .40 S&W, and I find the felt recoil to be less when loaded to the same velocities, offering faster follow-up shots. Whether you are a Glock fan or not, one thing is certain....they work, and they work well. 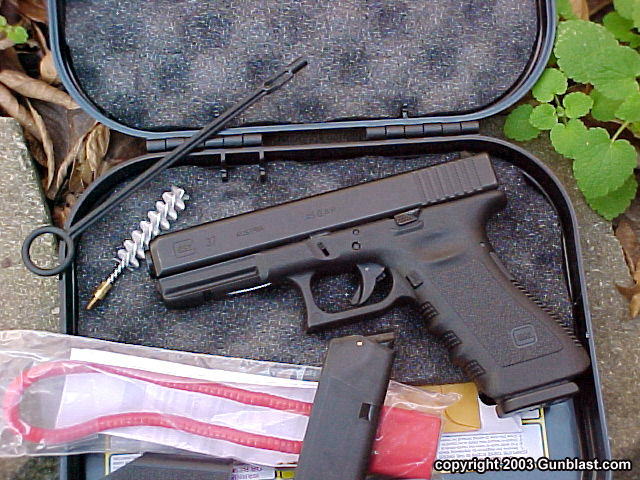 I have found that a new shooter can learn to shoot well with a Glock very quickly. 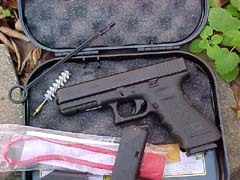 Glock is one of a very few handguns that I would trust to work in extreme conditions. For those Glock fans who want to carry a .45 concealed, the model 37 offers a relatively lightweight pistol that still packs ten rounds into a reliable and accurate weapon. 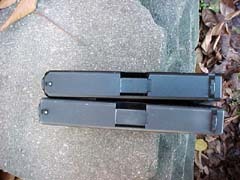 The model 37 comes shipped in a hard plastic case with two magazines, a magazine loading tool, cleaning rod, brush, instruction manual and cable lock. For shooters who find that the .45 ACP model 21 fits their hand well, the model 37 offers no advantage. For those who want .45 power in a full-sized Glock with a nine-millimeter sized grip frame, the model 37 chambered for the new .45 GAP is your baby. 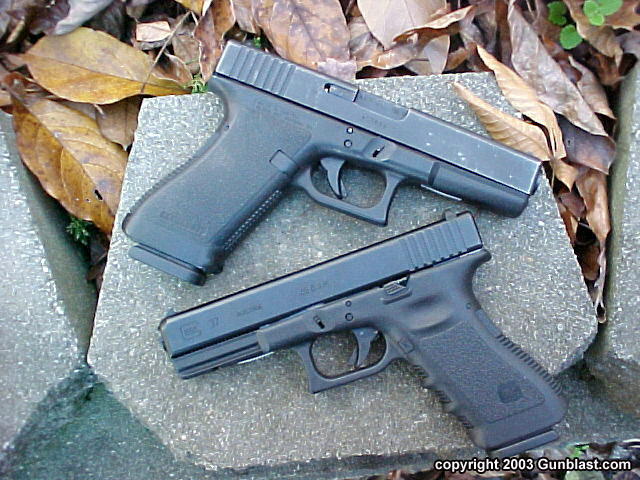 Visit Glock online at www.glock.com. 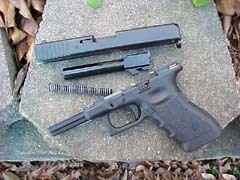 Author finds the Glock 37 in .45 G.A.P. 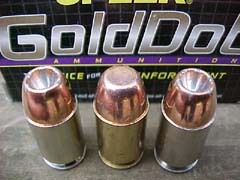 to be a fine choice for shooters who have trouble handling the larger .45 ACP version.